While releasing a “single” is pretty much the trending bread and butter for up-and-coming bands nowadays, it’s not as common a practice to see a brand new band pursue the release of a single, not as a one track but in the traditional format of two songs like one would find as a Side A and Side B on a vinyl record. 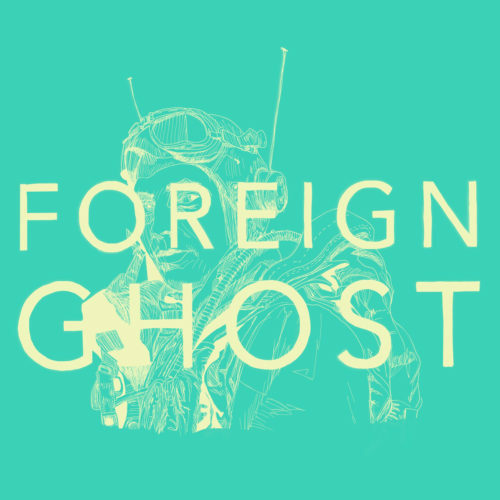 One might say two song “single” releases are a bit foreign among today’s release trends but perhaps that’s just the perfect things for Houston, TX indie rock band, Foreign Ghost. In light of this trio of tipped artist hats, what does that leave curious listeners with when considering the new duo of songs titled “The Bruce Banner of Sadness” and “Open Container”? Well, it might be more accurate to open with the idea that no pre-requsite artists should be tucked away prior to hearing the music at all. Since, quite frankly, what the band plays, doesn’t seem to fit with any of the sonic impressions these bands would brace one to have. However, that doesn’t mean what ends up coming through isn’t an enjoyable set of sounds. In truth, it just seems most like something else common to new bands: figuring out what you are when you play your instruments together. What could be called Side A, “The Bruce Banner of Sadness,” opens with a tonal brightness via clean guitar and a major key based melody that boasts far too many bent notes – albeit briefly but still notably so – to conjure up thoughts of anything true to pop punk or straight indie rock form. The bouncy rhythm of the drums agains the melodically carefree guitar leads make the song lean more instinctively to a mildly surf pop vibe. Of course, if genre labeling existed on a ranged spectrum like gain on a control surface, and a fader could show how much a band commits to a genre’s conventional sounds, rhythms, chord progressions or vocal aesthetics, the amount of surf pop on “Bruce Banner” wouldn’t be pushed all the way to a definitive, nearly clipping capacity. The track overall plays out rather clearly, not coated in an encompassing layer of distortion or reverb like a deeply surf pop committed song might otherwise be. Then there’s the fact that the primary rhythm on the snare and supported by the bass during the choruses, creates a flow that nods to the classic swing of doo-wop tracks, only helping the song lean more toward pop and less toward rock. Though different from expectations, what’s given is well performed, catchy, and from the standpoint of McBride’s lead vocal, quite charming. There’s an earnestness in McBride’s voice as he sings about the loss of opportunity for a relationship with a girl but it’s something that feels unique to him, as though it’s the very character of his single voice that gives the song that charming quality. There’s a tendency in both pop punk and in some cases, indie pop, to hear vocalists gravitate toward nasal-driven singing styles and for their voices to rely entirely on a head voice delivery for a thinner, more piercing quality. The lack of thinness and the embrace of a rounded, wholesome tone from McBride, accompanied by a confidence with correct pitch, is a refreshing difference from the norm. The realness of that approach gives the song’s protagonist a more relatable feel, like he’s the sweet guy from your college class or your roll-with-the-punches neighbor from around town, with neither being the kind of person who is “going for a look or a sound.” They just want to sing a song about things not working out with a girl and whatever happens with it, happens. No gimmicks, no forcing it, no expected outcomes. That kind of impression is very reminiscent of the Mountain Goats’ John Darnielle, who, when he recounts a story in song – whether deep and emotional or fanciful and imaginary – often sings with a straightforwardness that doesn’t push his natural (and very recognizable) voice, to be something it isn’t. The whole song is charming in that way and the friendliness of surf pop style only makes “The Bruce Banner of Sadness” even more so. This quality of “being what you are” carries over to “Open Container,” with McBride stepping back from the mic to give the lead vocal to keys player Tamar Farchy, which is a nice surprise on its own. Doing so lets the world know Foreign Ghost is a more versatile band than the great majority that have a but one designated lead singer. The variance in vocal style, range, and quality, also (perhaps a little cleverly) cleanly reinforces the distinct Side A / Side B nature of the release. Furthermore, it gives this first introduction to Foreign Ghost some admirable contrast, raising the ceiling of the band’s potential right from the get-go. And contrast is undeniably the name of the game with “Open Container” but interestingly, the difference, though stark, isn’t the kind that feels random to the point of dissatisfaction. It’s more akin to a natural type of opposite. Where “The Bruce Banner of Sadness” reflects a more downtrodden narrative but does so in a moderately jovial manner that feels like letting fun reign on the beach during a clear summer day, “Open Container” is more like the approaching dusk hours of that same day. The front end of the main melody’s motif see-saws on a dynamically reserved major third interval, and overall, the arrangement is less dense. That same clean guitar tone leads but instead of bending tones and eliciting thoughts of curling waves in hectic tides, the notes linger through a delicate reverb that makes the echoing tones feel more like ripples on calm water. And though the rest of the band is there to provide backing and harmonization, there’s much more room for the parts to breathe in the latter over the former. The drums provide a bit of dynamic punch but their presence functions less like a hammer meant to break up the rest of the music and more just like that of a stabilizing rudder. Kick drum and floor tom fill the lower end alongside the soft-edged bass without domineering and the occasional splash of the cymbal provides sonic texture without detracting from the otherwise smooth and easygoing flow of the song. The fact that “Open Container’s” lyrics are so metaphorical themselves (You’re like waiting at the doctor’s office / There’s nothing to read / I’m a new tattoo on your wrist / roll up your sleeves), makes the ease of allusion for its musical counterparts seem not that odd in a complete comparative context. The idea of surfy relaxation continues from the first song as well but, this time it’s more about a specific kind of peaceful reflection in the darkening hours, rather than unwinding via midday fun. In this way, Foreign Ghost offer up two specific kinds of moods but the songs hold enough thematic relation to one another for them to make the perfect set of debuts. The tonal straightforwardness in the vocal parts of McBride and Farchy in both songs is refreshing to a degree – especially for the former because the clearness of McBride’s voice cuts through a somewhat lively arrangement and melody. However while Farchy’s natural voice is pleasant on its own, the looser, more blended aesthetic of “Open Container” doesn’t create an organic-sonic palate cleanser effect against the music in the say way. Instead, Farchy’s voice seems less attended to by comparison, and not made to fit with the band and hit its potential for the song in maybe the best way it could have. This kind of creative tweak though, is one that comes with time, more songwriting, and is ultimately a factor of taste so it remains to be seen what Foreign Ghost will sound like as the band and its music become less foreign to listeners and more something to be sought out in between new releases. “The Bruce Banner of Sadness / Open Container” is available now through Bandcamp.